A terrain surface dataset that represents the height value of all natural and built features of the surface of the city. Each pixel within the image contains an elevation value in accordance with the Australian Height Datum (AHD). The data has been captured in May 2018 as GeoTiff files, and covers the entire municipality. A KML tile index file can be found in the attachments to indicate the location of each tile, along with a sample image. 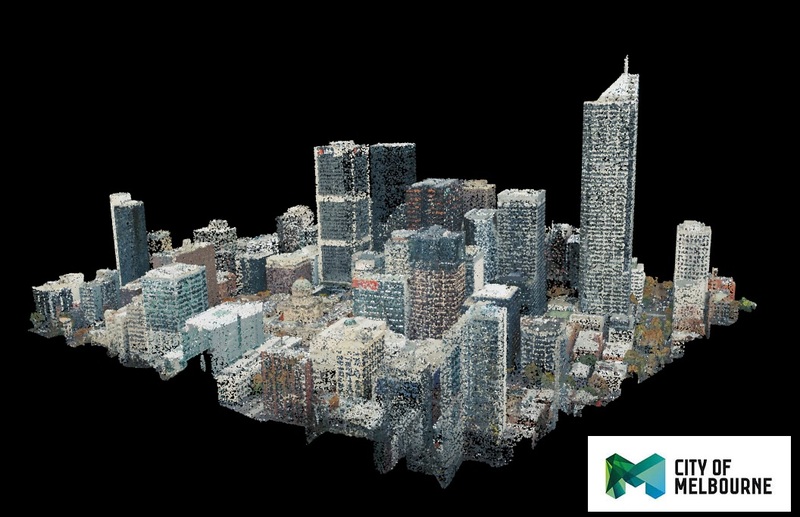 3D point cloud representing all physical features (e.g. buildings, trees and terrain) across City of Melbourne. The data has been encoded into a .las file format containing geospatial coordinates and RGB values for each point. The download is a zip file containing compressed .las files for tiles across the city area. The geospatial data has been captured in Map Grid of Australia (MGA) Zone 55 projection and is reflected in the xyz coordinates within each .las file. Also included are RGB (Red, Green, Blue) attributes to indicate the colour of each point. For an interactive sample of the data please see the link below. 3D textured mesh (photomesh) representing all physical features (e.g. buildings, trees and terrain) across City of Melbourne. The 3D textured mesh is provided in object file format (.obj) and is accompanied by material (.mtl) and image texture (.jpg) files. The data has been split into a series of tiles covering the entire municipality. An index file (Tile_Index.kml) is included to indicate the geo-spatial location of each tile. To position the mesh in its real world location, use the origin coordinates found in the metadata file (metadata.xml). The 3D textured mesh is provided in different levels of detail, as indicated in the file name of the .obj filename. The levels of detail vary from L13 (lowest level of detail) to L20 (highest level of detail). For an interactive sample of the data please see the link below (WebGL browser required - Google Chrome recommended). Through the download an use of this data you agree to the licensing and disclaimer conditions. This public register of building permits lists all building permits for building works issued by Melbourne Certification Group, in and outside of the City of Melbourne, and also any building works issued by Private Building Surveyors within the City of Melbourne. ​The information provided is extracted from the records held by City of Melbourne. For a definition of the building classification type please see the attachment. This shapefile shows all of the footprints of all buildings within the City of Melbourne. The footprint is the outline of the total area of a lot or site that is surrounded by the exterior walls of a building or portion of a building, exclusive of courtyards. In the absence of surrounding exterior walls, the building footprint shall be the area under the horizontal projection of the roof. Please see attached PDF for the data dictionary. The Australian Height Datum (AHD) is the national vertical datum for Australia. The National Mapping Council adopted the AHD in May 1971 as the datum to which all vertical control mapping would be referred.